As admeenistrator o the Coalition Proveesional Authority o Iraq. **As Actin Preses o the Govrening Cooncil o Iraq. Saddam Hussein Abd al-Majid al-Tikriti (Arabic: صدام حسين التكريتي Ṣaddām Ḥusayn ʿAbd al-Maǧīd al-Tikrītī ; 28 Aprile 1937 – 30 December 2006) wis the fift Preses o Iraq frae 16 Julie 1979 till 9 Aprile 2003. A leadin member o the revolutionary Ba'ath Pairty, an later, the Baghdad-based Ba'ath Pairty an its regional organisation Ba'ath Pairty – Iraq Region, which espoused a mix o Arab naitionalism an Arab socialism, Saddam played a key role in the 1968 coup that brought the pairty tae lang-term pouer. As vice preses unner the ailin General Ahmed Hassan al-Bakr, an at a time when mony groups wur considered capable o owerthrowin the govrenment, Saddam creautit security forces throu which he tichtly controlled conflict atween the govrenment an the airmed forces. In the early 1970s, Saddam spearheidit Iraq's naitionalization o the Wastren-awned Iraq Petroleum Company, which haed lang held a monopoly on the kintra's ile. Throu the 1970s, Saddam cementit his authority ower the apparatuses o govrenment as Iraq's economy grew at a rapid pace. As preses, Saddam maintained pouer durin the Iran–Iraq War o 1980 throu 1988, an throughoot the Persian Gulf War o 1991. Durin thir conflicts, Saddam suppressed several muivements, pairticularly Shi'a an Kurdish muivements seekin tae owerthrow the govrenment or gain unthirldom, respectively. Whereas some Arabs veneratit him for his aggressive stance against foreign intervention an for his support for the Palestinians, he wis widely condemned for the brutality o his dictatorship. Bi 2003, the admeenistration o U.S. Preses George W. Bush an Breetish Prime Meenister Tony Blair claimed that Saddam maintained links tae terrorist organisations, haed wappens o mass destruction, an sicweys needit tae be owerthrown. In Mairch o that year, the U.S. an its allies invadit Iraq, eventually deposin Saddam. Captured bi U.S. forces on 13 December 2003, Saddam wis brought tae trial unner the Iraqi interim govrenment set up bi U.S.-led forces. On 5 November 2006, he wis convictit o chairges relatit tae the 1982 killin o 148 Iraqi Shi'ites convictit o plannin an assassination attempt against him, an wis sentenced tae daith bi hangin. Saddam wis executit on 30 December 2006. 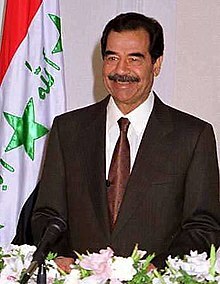 Bi the time o his daith, Saddam haed acome a prolific author. Amang his wirks are multiple novels dealin wi themes o romance, politics, an war. ↑ Saddam, pronoonced [sˤɑdˈdæːm], is his personal name, an means the stubborn ane or he who confronts in Arabic (in Iraq an aa a term for a caur's bumper). Hussein (Sometimes also transliterated as Hussayn or Hussain) is no a surname in the Wastren sense but a patronymic, his faither's given personal name; Abid al-Majid his grandfaither's; al-Tikriti means he wis born an raised in (or near) Tikrit. He wis commonly referred tae as Saddam Hussein, or Saddam for short. The observation that referrin tae the deposed Iraqi preses as anerlie Saddam is derogatory or inappropriate mey be based on the assumption that Hussein is a family name: thus, the New York Times refers tae him as "Mr. Hussein", while Encyclopædia Britannica uses just Saddam . A full discussion can be foond  (Blair Shewchuk, CBC News Online). ↑ Unner his govrenment, this date wis his offeecial date o birth. His real date o birth wis niver recordit, but it is believed tae be a date atween 1935 an 1939. From Con Coughlin, Saddam The Secret Life Pan Books, 2003 (ISBN 0-330-39310-3). ↑ See PBS Frontline (2003), "The survival of Saddam: secrets of his life and leadership: interview with Saïd K. Aburish" at . ↑ "Saddam Hussein executed in Iraq". BBC News. 2006-12-30. ↑ Theodolou, Michael. New Iraqi literary king is not-quite anonymous. The Christian Science Monitor: 11 December 2001. ↑ Boncompagni, Hala. Saddam's lawyer plans book on president's 'secrets'. Middle East Online: 23 February 2007. ↑ Santora, Marc and John F. Burns. From Hussein, a florid farewell to the Iraqi people. The New York Times: 4 January 2007. ↑ Barr, Robert. Hussein tends garden, pens poems, official says. The Boston Globe: 27 July 2004. ↑ Hogg, Chris. 'Saddam novel' on sale in Tokyo. BBC News: 18 May 2006. ↑ Cockburn, Andrew and Patrick Cockburn. Saddam Hussein: An American Obsession. London: Verso, 2002, p. xviii. ↑ Blitzer, Wolf, et al. CIA corruption probe; President Bush to give immigration speech Monday night; Iraq: militia challenge. Cable News Network: 12 May 2006. Transcript. ↑ Federal Bureau of Investigation. Interviewing Saddam: FBI agent gets to the truth. United States Department of Justice: 28 January 2008.